I’m always somewhat fascinated with “the last one.” Have you ever seen like a shuttered mall? Or, amusement park? I’m always curious about the last day. What was that like the last day it was open? Who was there? What were they doing? What were they seeing and feeling? And, in my own life, these days I’m always trying to kind of slow down and be in the moment instead of getting ready for the next thing. Savor the last one. So this could be the last one. No, the team isn’t mathematically out of it. And, it felt good last night for the club to get a win on enemy ice in the Wyoming Valley. But for me, baseball is coming, and the schedule gets tighter. Weather becomes important. This could be my last game of the season–and the last preview blog of the season?–maybe, who knows? Because there are no guarantees in life, it could be my last preview blog ever, as ye olde blogger doesn’t plan on doing this for ever and ever. (I did renew my tickets–moving to a better location hopefully–for next season. So, I’m not planning any changes. But, we’ll see.) If the team does qualify for the post-season, of course I’m ‘all in’ for that. It’s just not looking great right now and there are only three home games left. ‘Points’ and ‘ROW’ are important–and we have a game in hand on Providence. But, they keep winning and control their destiny. So, we need help. It’s a tough spot with only 11 games left, including tough road two-fers in Charlotte and Cleveland. But stranger things have happened, and that’s why we play the games. So buy those playoff strips! And replenish your orange T-Shirt supply! Reading is in last place–kinda crappy for a .500 team, eh? Well, they’re not out of it any more than the Phantoms (or, Flyers) are, as they’re 5 standings points out. All three organizational clubs are facing the same long odds, and probably the same fate. 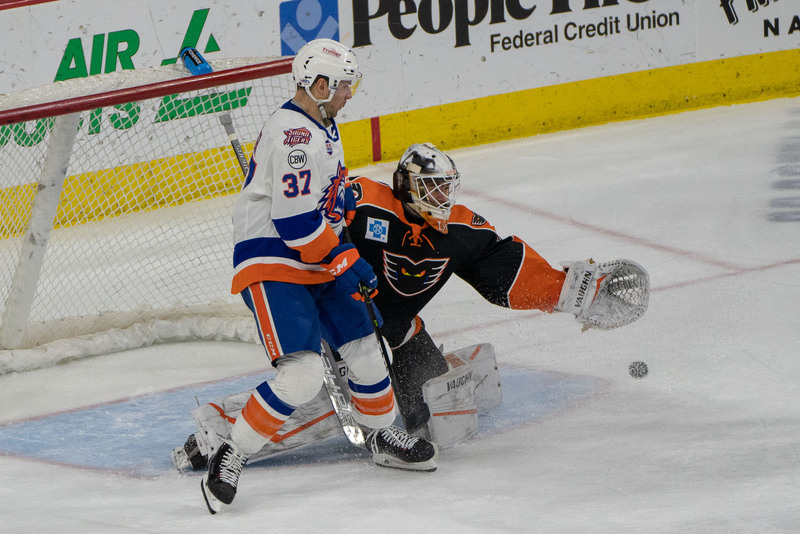 The Phantoms went a couple stops North on the turnpike yesterday and defeated the Wilkes-Barre Scranton Penguins 3-2 behind two goals from Nic Aube-Kubel and a strong game from Alex Lyon in net. It allowed the Phantoms to jump the Pens in the standings, if only for a day. It also allowed Charlotte to clinch a playoff spot. There was some chippiness near the end of the game last night, I understand, so we’ll see if any of that carries over to tonight. 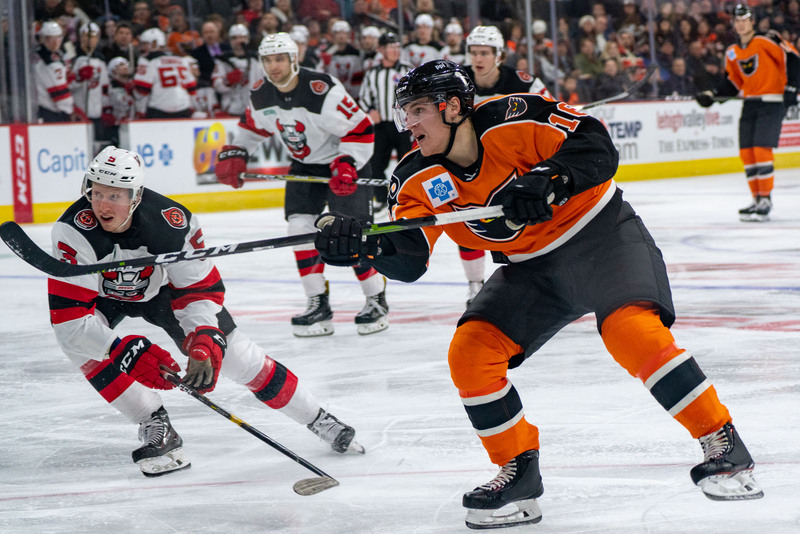 For the Phantoms, forward Justin Bailey is up with Philly–although at this point he’s been on the ’emergency recall’ carousel so long he may have reached a higher consciousness where he can actually play for both teams at the same time. Misha has been out with an injury, which I haven’t received any updates about. Defenceman Rob Michel was added from the college ranks on an ATO. He was the captain at Maine, I understand, and appears to be the stay-at-home type. He’s wearing #39 and did take warm-ups last night so I suppose he could make his debut tonight. Along with that, blog-favorite defender David Schlemko was a surprise scratch last night with an unknown injury. Captain Colin McDonald had a baby. Well, his wife did. He missed last night’s game on paternity leave, and his status for tonight is unknown. The Penguins lost important winger Adam Johnson to Pittsburgh, but received center Blandisi and blue liner Riikola in return. The Pens also have a couple players out with injury, who didn’t play last night but might tonight, as far as I know. 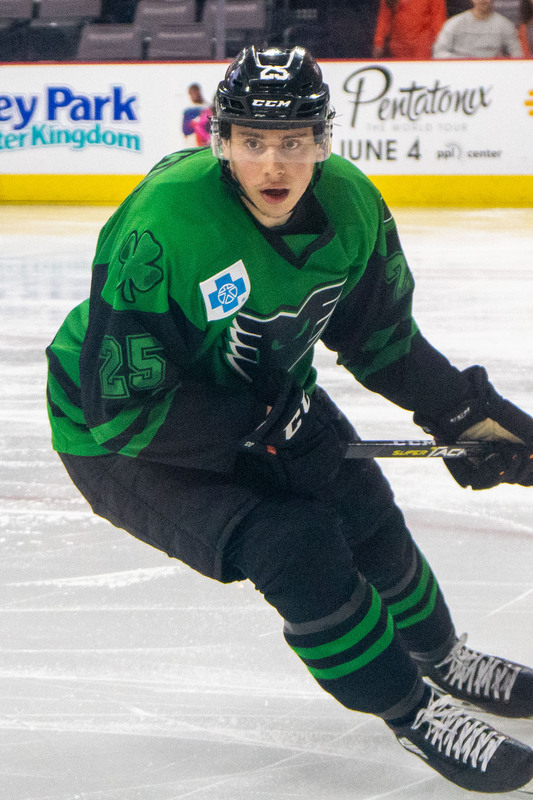 They also added a college player–as they always seem to find the good ones–in winger Jake Lucchini who played his first game against us last week and did well. Win. Watch to see if we can get another win. And watch the scoreboard while you’re at it. A Binghamton win in Providence would be helpful. Goalie Matchup. Jarry was in net last night for WBS as they’ve been riding him hard and putting him away wet. Watch to see if they go back to him again tonight, as he’s played something like 16 games in a row, I think, but golly he plays well in our building. For the Phantoms, watch to see if we go back to Lyon who played well against them last night, or with the veteran McKenna. I’m fine with either, really. Watch the special teams match-ups. Both teams were 0/5 on the man advantage last night, so the PK units held the day. Watch to see if that happens again, or if one team gains an advantage by netting some power-play markers. “Want-To.” Watch for which team seems to want this game more. Will the Pens be determined to get points after receiving none last night? 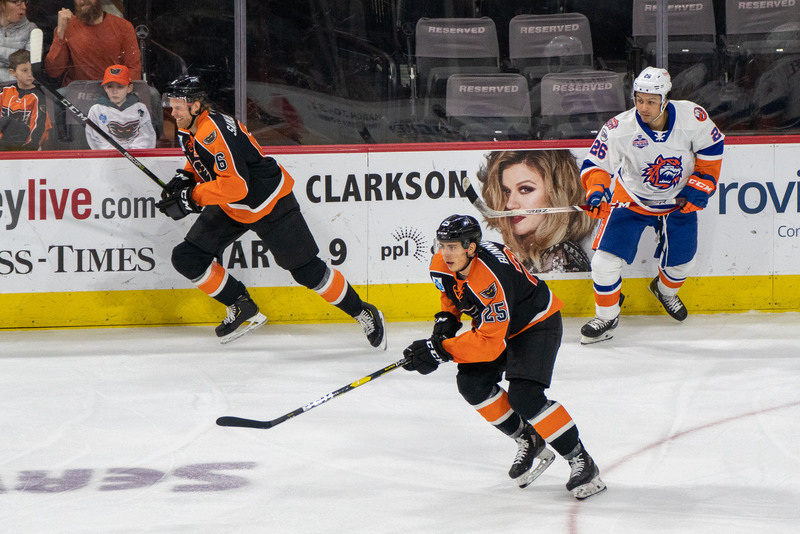 Will the Phantoms be complacent? Will one team give up on the season? New Guy: watch to see if #39 makes it into the game. Does he look good? Should we sign him? From here the guys head out on the road. They’ll be in Rochester Wednesday night, then on to Cleveland for two games next weekend, Friday and Saturday. We’ll be hosting the NCAA’s next weekend at the PPL Center. The following week is the first week of April, as the local baseball team begins activities, the hockey team will be in Charlotte for two games on Tuesday 4/2 and Wednesday 4/3. The Hamilton Street Heroes will then return to home ice on the weekend of 4/6 and 4/7–Saturday and Sunday–for two games against Wilkes, which play directly versus the baseball squad across the river. In the last week of the season the club travels to both Hershey and Providence–important games if we’re still fortunate enough to be alive for the post-season–before wrapping up the regular season at home on 4/13 versus Hartford, in a game I’ll be unavailable to attend, unfortunately. So that’s why this might be it for me–let’s go Phantoms and let’s go Phan Nation, let’s finish strong. Cheryl Pursell. I don’t think she shot any hockey this season, but I’ve used her work on these pages this season. You’ll see her work a lot more as we transition to baseball. But it’s the same idea with the high quality images which I don’t pay for–I only have my thanks to offer. Michael Ianniello. I haven’t met Mike personally, but he moved here from Bridgeport mid-season and took over the media department. He’s been a big help with getting me the access that I need; he’s very professional and an asset to the Phantoms organization. I thank him for his help this season. And a thanks to Katie Nork who does media for the arena, as well. Dan and dE. Noise Nation Dan is the editor emeritus around here these days, but his help and guidance behind the scenes is part of the reason I continue. der Eishockeyzuschauer hasn’t been around lately, and with college hockey coming up I find that worrisome. Hopefully, wherever he is and whatever he’s currently doing, I hope he’s OK and I thank him for his past contributions on these pages. Friends and Phamily. A big thanks to everyone around the arena who stops me to say hello, or thanks me for the blogs, or anything of that nature. Thanks to folks on Twitter and SpaceBook for our interactions, and especially to those who feed me inside-information along the private channels. I don’t get a lot of comments, below, but to those who take the time to do so (Rich in particular) I’m thankful–I’d rather have comments here than on SpaceBook.) And the Phan Club–the Phamily as it were–to those who dedicate their time and efforts to managing that cause, makes the team and organization look that much better. I don’t know if the organization thanks you enough, so I will.